Peel, quarter and boil the potatoes until tender. Quarter and chop up cabbage -- boil in lightly salted water until tender, about 20 minutes. Meanwhile, saute the onion in butter until slightly caramelized in a skillet. 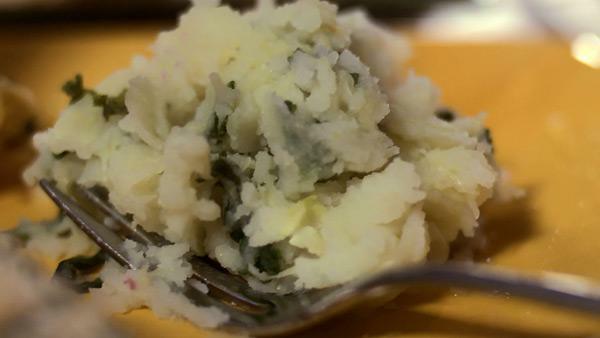 Drain and mash the potatoes using warm milk and the rest of the butter. Drain the cabbage well and add to the potatoes. Add potato mixture to the onions in the skillet and mix well. Hide a ring in a piece of parchment paper before serving -- the one who finds it will be married in the coming year -- or will have good luck.